First one is at Hever Castle, the second is along the road on public ground near the church. Apologies, broken link, here's the new one. They worked perfectly when first posted. 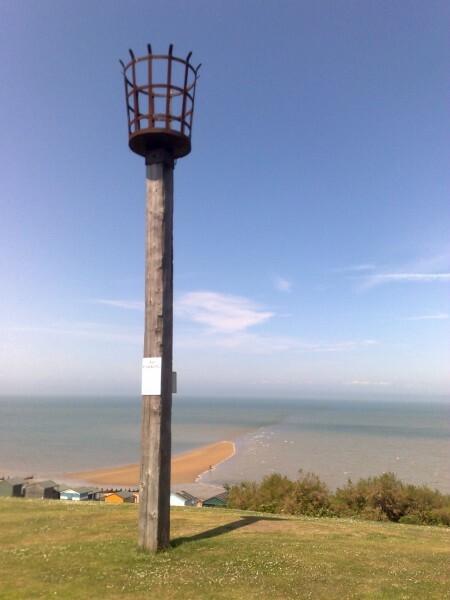 The first beacons in Kent, apart from possible Roman or Saxon beacons, were set up in 1326. From 1377, the first year of Richard II. "An ordinance for safeguarding the Counties of Kent and of Essex, particularly for the towns lying on the River Thames from the perils which, may suddenly come upon them from our enemies, which God forbid; and also for the safeguard of the Navy being in the ports of the said river. 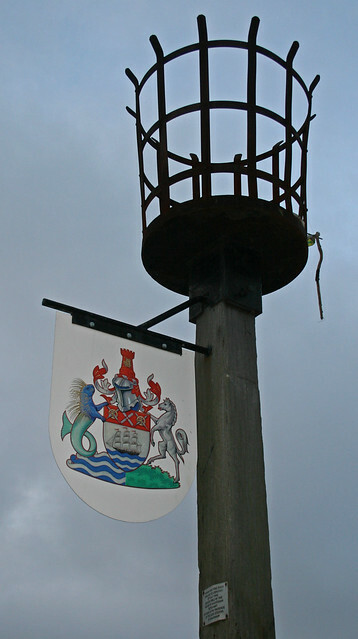 First, let there be ordained in the Isle of Shepeye a beacon (beken), and at Showbery in Essex another beacon. Item, at Hoo in Kent a beacon, and at Fobbyng in Essex another beacon. 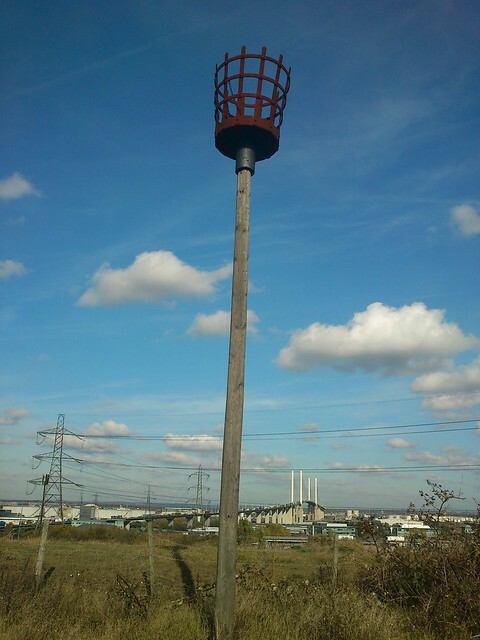 Item, at Cleve in Kent a beacon, and at Tilbury in Essex another beacon. 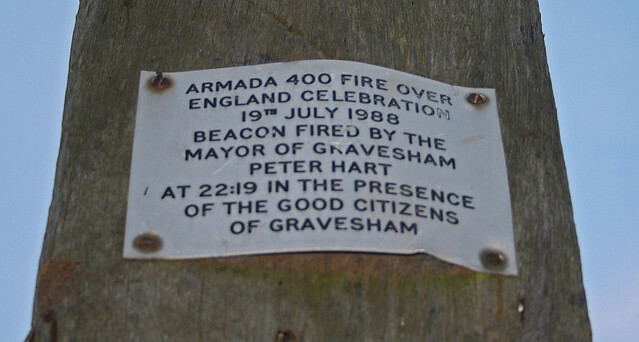 Item, at Gravesend in Kent a beacon, and at Hornedon in Essex another beacon. Item, that by the especial command of our very noble Lord, the King, the Sheriffs (Viscountz), Constables and other officials in the aforesaid parts of Kent and Essex be charged that all the said beacons be speedily and suitably set up and prepared in the above-named places for the safe-guarding of the country and of the said Navy. Item, that as soon as the said beacons be made, they shall be well and suitably watched, as well by day as by night, without fail. Item, that the watchmen, who, at the time, shall be at the said beacons, and particularly, at the beacons of Shepeye and Shoubery, shall be from time to time warned and charged that, as soon as they can see any vessels of the enemy coming by sail or by oars towards the said river, then the said two beacons of Shepeye and Shoubery be set on fire, and therewith to make all the noise they can with horn or by shouting, to warn the country round to come with all their force to the said river, each to the aid of the others, to resist our enemies." Taken from The Beacon System in Kent, a 23 page paper by H. T. White, A.M.I.C.E. Archaeologia Cantiana. Vol. 46 1934. The paper includes the 1570 map by William Lambarde. Having just joined the forum, and at the risk of over-egging it may be of interest to know that Wiliam Lambard, the historian who wrote about Kent in 1570, published a map showing the position of the beacons (he was criticised for doing so, for security reasons!). The map can be seen at http://www.folkscape.org.uk/beackent.htm The beacons were only marginally successful - inclement weather and especially fogs; and during the day they were not easy to see - but their main drawback was that the only connection to London from the entire coast where continental invasions were likely - from Folkestone to Fairlight and beyond westwards - was via the Medway Gap, where there was a beacon at Birling. The beacon on Windmill Hill, Gravesend (shown on one of the pictures) is being lit at 10.15 this evening. A nationwide network of beacons, organised by the Royal Institution Of Chartered Surveyors in eight continuous chains linking Windsor with the extremities of the United Kingdom, the Channel Islands and the Isle of Man. The Beacons are establishing at Canterbury, Shorncliff, Barham, Isle Of Thanet, Shottenden, Hythe, Poolingdown, Westwell, Pluckley, Lynham Hill, Chatham Lines, Wrotham Hill, Tenterden, Highgate, near Hawkhurst and Gouldhurst, which beginning from Canterbury or Shorncliff, will be succesively fired on the near approach, or actual landing of the enemy on the coast of Kent, and on which signal, everyone is to assemble at his known place of rendezvous, and there expect and recieve orders from the general Officer, under whose comand the several Volunteers and other Corps may be placed. The fire-beacons are stakes of wood, and other materials, with a pole passing through them, on the top of which is a small white flag, to make their situation more visable. When the alarm is given in the day, means will be taken to make a great smoke, accompanied with fire. I'm sure there used to be beacons on the tops of some church's including Rainham church. These ran up from the coast and were the highest point so could be seen for a long distance I think these ran from the coast up and into London. And if they were all replaced. Including one in the Ashcroft area.